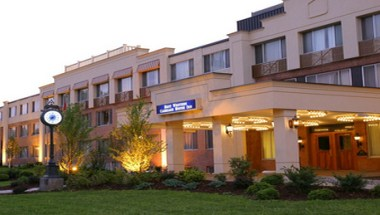 Explore all of the beauty that Northern New York has to offer at the Best Western Watertown Fort Drum. Located in the heart of Downtown puts us in the center of all that the North Country has to offer visitors. Located just 6 miles from Fort Drum's main gate, we are proud to serve our soldiers and their families. Our pet friendly hotel and staff make it easy for families transitioning into our local community. Spend the day cruising the St. Lawrence River and visiting majestic castles. Explore the history of Sackets Harbor and enjoy a relaxing day tasting some of our local wines on the Seaway Wine Trail. You can shop the day away at the Salmon Run Mall or paddle through the rapids white water rafting on the Black River. Conveniently located within minutes of local businesses like Samaritan Medical Center, New York Air Brake, and Jefferson Community College. Whether in their room, at breakfast, eating in our on site Italian restaurant, or in one of our meeting rooms ours guests can stay productive with our free high speed wireless internet access. 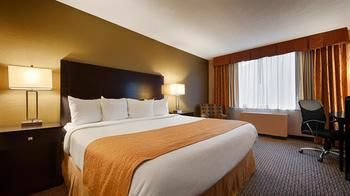 While visiting our Watertown, NY hotel our guests can enjoy our complimentary deluxe hot breakfast, heated indoor pool, sauna, fitness room, and 24 hour coffee and tea in our lobby. Catch up on your favorite shows on our 42'' LCD TVs or enjoy a DVD from the library located at the front desk. We invite you to become a part of our Best Western Watertown family and experience the best customer service in the North Country. No matter what brings you to our region, relax and let our wonderful staff take care of you. Traveling North on Interstate 81 use Exit 44 Watertown Center and follow to Downtown Watertown. Traveling South on Interstate 81 use Exit 45 Arsenal St and follow to Downtown Watertown.